As far as the thread went, ignoring the insignificant noise of SDN's "Captain Seafort" who actually whipped out the old yarn of claiming packing crates are phaser-proof (a case of projection from Star Wars, might I add), the basic gist of the rest of the thread is whether a Sherman's three inches of steel was sufficient to prevent easy penetration by phaser. 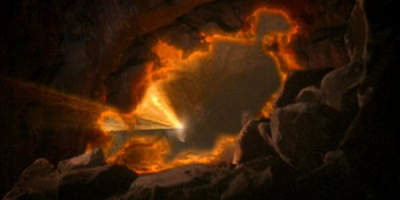 My position was that since we've seen phasers detonate meters-thick stone walls, cleanly vaporize smaller volumes of rock with no adverse local effects, vaporize and blast metal, and so on, that mere steel simply cannot be expected to hold up. Note also that the sword and tree-slicing flying kligat weapons of the Capellans were vaporized along with the rest of them. The exact composition of any of these is unknown, but presumably comparable to steel and normal wood, respectively, at least. Two of the tiny hand phasers were sufficient to take out Landru's wall. This being the main wall protecting the main computer of the remains of a society that had the capacity to down starships and construct lights that stayed on for 6000 years, I am guessing it is not mere concrete. How thick is that casing? I'd say at least an inch. And is it mere steel? Not likely. 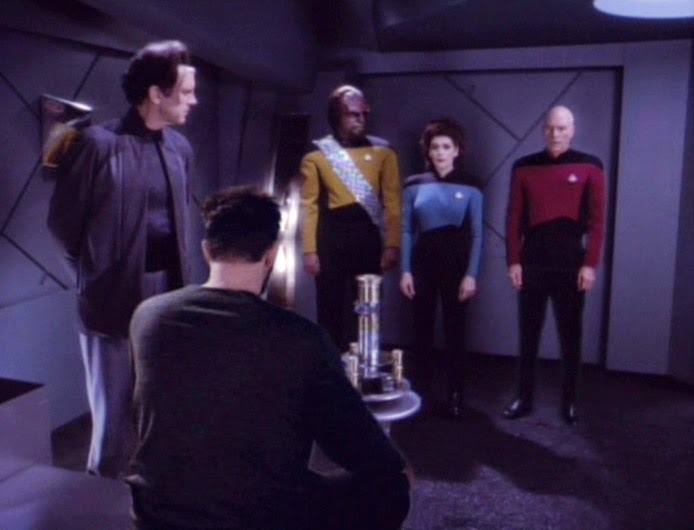 Remember that the corridor wall panels of the Enterprise-D are tritanium in some cases ("Where Silence Has Lease"[TNG2]), "solid duranium" in others ("A Matter of Perspective"[TNG4]). And although Klingon baakonite (used in bat'leth construction) is never identified as the material for the d'k tagh knives, also, there is no reason to assume they'd make the knives and swords out of vastly different metals. Then we can return to TNG-era examples, such as the vaporization of a small quantity of the cheap metal noranium by having the phasers, at level 7 out of 16 available, generate temperatures north of 2300 degrees, or more than sufficient to melt steel. As for the volume of noranium vaporized, I agree it was not an extreme amount. That was not the point. That they could heat a pile of it so that some of it was at temperatures higher that steel's melting point using a low phaser setting was the point. They were at less than half the maximum. And, as always, there's "Frame of Mind"[TNG6], in which Riker sets his phaser to maximum (setting 16), on a wide field, and comments that it should destroy half the building, a building which appears to be fairly large and to have metal-clad walls. In short, three inches of WW2 steel tank armor could be breached faster than you can say "Klaatu barada nikto", though I don't expect a Gort-like tank melt. Of course, when you get right down to it, this is all pretty silly, even over and above the nerd combat over fictional universes. Does it really make sense that an AK-47 or even a 9mm handgun can penetrate a car door easily but the standard weapon from 300 years later that can blast meters of rock or vaporize a man is just gonna burn off the paint? I think not. Of course, Young would have you believe that the argument of armor penetration is that the tank is somehow going to pop like a balloon. That's also pretty silly. I mean, I suppose the Federation guys could choose to do a clean vaporization of a small hole into the tank armor (and, unlike Spock getting injured by a nearby vaporization, keep everyone okay), and then try to politely stun the guys inside with precision shots from just the right angles. Or, maybe they're supposed to cut a big glassless window and then try to stun the guys in the new open-cockpit-design tank. But, more likely, you'll do something similar to the explosive Insurrection shots above, in which case the flimsy meatbags inside are, as is so often the case with even modern anti-tank rounds, the main weakness of the tank. In the main, this is akin to discussing whether a 9mm handgun can take out a Medieval knight in full regalia. The answer to that is yes . . . the thin armor composed of questionable steel isn't going to do much. Shot placement still counts, and depending on how fast you want him dead this can even be true if we subject the knight to an AK-47. And yet even the venerable 9mm is subject to attacks online that it is only marginally acceptable for self-defense. The alternative view as espoused by Seafort and Tyralak was that somehow forged metal is going to be well-nigh impervious, on the grounds that it is around 2-3 times denser than rock. Why would the phasers will suddenly have no capacity to defeat something as comparatively light as steel? Let's ponder that further, since that sort of thing is a favorite of the anti-Trek crowd like Brian, Seafort, and the SDN gang. Phasers are known to have trouble with certain materials of extreme density. Neutronium, for instance, is pretty dang phaser-resistant, but since is gravitationally-condensed matter with a density around a dozen orders of magnitude higher than anything on Earth this is not unexpected. Diburnium-osmium alloy has an off-the-charts density of 275,000 kg/m^3, which is 35 times denser than steel. Spock noted that the Kelvan material from "By Any Other Name" was simiar to diburnium but considerably more dense, presumably putting it in the same range. All of these were phaser-resistant on account of their density. So yes, extreme density is a thing, the key word being "extreme". There are also some materials that are phaser-resistant but where density is not the likely reason why. 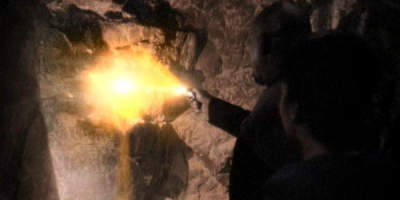 Barrels made of duridium were believed by Sisko to be capable of at least briefly resisting Jem'Hadar polaron weapons in "Blaze of Glory"(DSN5). One would commonly avoid making barrels out of the heaviest material around, given that by the nature of barrels you're obviously planning to move them. You aim for the required strength at lowest weight ... we often use steel for strength, but where possible we also use plastic and even paperboard drums. The notion that duridium has some special proprerty seems confirmed by the fact that it is one of those rare materials still seen to be mined for and transported interstellar distances in the 24th Century ("The Adversary"(DSN3)). We never hear of iron or other common ores being shipped about. Also, in "By Inferno's Light", Goo-Bashir is all excited about an order of new duridium darts. Despite the numerous appearances and conversations about darts we never hear much about the preferences of O'Brien and Bashir, but modern dart aficionados aim for high strength for durability and low overall weight. Regulation darts are limited to 52 grams, though it is said to be rare to see them over 30 grams. To achieve slender barrels (the part that you hold), high-density material like tungsten is often used. The shaft (the part extending back to the flight, or stabilizing wings) is then kept as light as possible. Wood, plastic, nylon, aluminum, and even carbon fiber shafts exist, though these break and bend fairly quickly. Some high-quality championship darts use solid titanium shafts for maximum strength, durability, and break/bend resistance, even covering the tungsten barrel to prevent it from becoming worn with use. 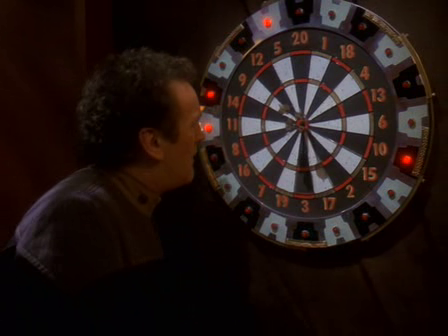 While we don't see the darts Goo-Bashir ordered, the very next episode does feature a dart game. 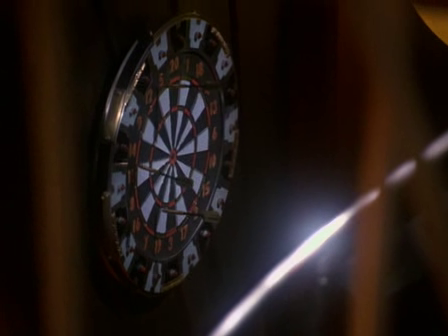 The darts appear no more slender than darts of today, though it appears that Bashir may favor slimmer darts than O'Brien. Assuming his were the duridium darts, then we can point out that there's no indication of them being significantly more massive than modern darts. Suffice it to say, between barrels and darts, it sounds like duridium is a very strong, durable material of limited density. 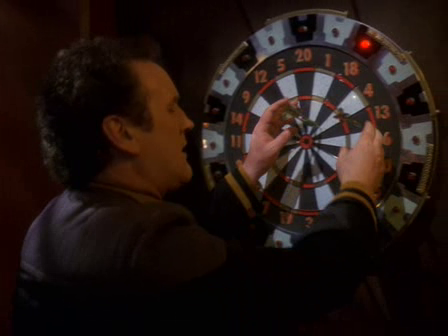 Is the toranium inlaid on some DS9 doors extremely dense? I wouldn't think so. It is a door, after all. But, then, we've seen some ridiculous doors in use (such as the Dominion penchant for neutronium doors) so I could be wrong. In any case, like duridium barrels, some things are just inherently resistant to the tech in use. For a very rough modern analogy, who would've ever thought that a mirror and heavy clothing would be useful against the latest military gear? Well, when you are being fired upon by dazzlers and those freaky skin-heating beam things, they are. Phasers, however, are seen to be effective against most any common target. Yes, the phasers can be tuned for certain things, e.g. killing carbon-based life versus silicon-based. 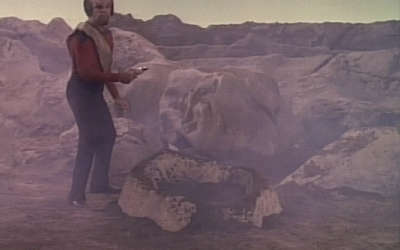 But even in "Devil in the Dark"[TOS], wherein the phaser-resistant Horta was a hard, naturally-armored target of silicon biochemistry, Kirk was pondering using their phasers to dig their own tunnels in the rock to out-maneuver the fast-tunneling creature, so there was more to the story than just silicon being troublesome ... 90% of Earth's crust is composed of silicates, after all, and we have no specific indication of that world being off-the-wall in that regard. If anything, it should've had more of such minerals, not less. Brian's cherry-picked example of a phaser event is to latch on to "Too Short a Season"[TNG1] in which Tasha and Worf are ordered to cut through an alien wall constructed of 'steelplast'. Brian excitedly notes that steelplast is an actual term. Now, so far as I can tell it's mostly a brand name, but whatever . . . it may not have even existed when the episode aired. And in any case, hypermatter is also a real term in modern science, but I don't see him trying to use that to nerf Star Wars like he tries to use a brand name to nerf Star Trek. But let me digress . . . So, Tasha and Worf are ordered to cut through a wall because some hostages should be somewhere beyond it, along with probably some badguys. They cut it quiet-like with phasers in a manner quite similar to Scotty cutting through the bulkhead ever so slowly in fear of damaging something within the wall as in "The Naked Time"[TOS]. But per Brian, this is the crème de la crème of phaser output and activity against steel, and on that basis he declares that it'll take Worf several, several seconds to even penetrate the side of a Sherman, during which time the Sherman (or the APC stand-in he uses) will have the option of firing back a lot. Seems obvious to me that they were using a low setting, especially given what we know of phasers from above. The alternative is that this steelplast material, like the casing to the "Dreadnaught" warp core's magnetic constrictors, must be something really badass if a phaser takes a long time to penetrate it. Either of those possibilities would make a good logical synthesis of the data. Thus, Brian rejects them both. Alas, for a Star Wars inflationist (and, by necessity, Trek deflationist), cherry picking of this nature is not uncommon. To quote another part of "Friday's Child" . . . "What Brian has said is unimportant, and we do not hear his words." So the point here, still, is that the suggestion that common metal will resist phasers is on untenable ground. I am not saying they could make a feet-thick steel wall blow up like the Insurrection limestone ... I'm not not saying it either, mind you ... but that is not required. We're talking about penetrating three inches of steel. That's gonna be child's play. There is simply no plausible argument yet presented that would suggest this is going to be more phaser resistant than several feet of rock. Given that the AT-ST probably features steel in its thin-walled cab construction (which still represented a major improvement over the prior generation's *open cab*), I would wager that the Sherman tank's three inch armor should be a fair guide, if not actually generous. Young's insensate argument, now spread across two separate videos, is that the tank is automagically going to acquire and attack the stupid Federation guys who apparently rush the tank while exposed, and who also somehow forget that they can lay down fire on targets over a kilometer away, as has been seen in the canon. I've got some material stored up on this tactical ineptitude argument of his, along with comparisons to real WW2 tank combat ranges, but this post is long enough already. So, expect Part II in a few days. Oops, I have a couple of editing issues with the above. Haste makes waste. For one, I forgot to add some pictures regarding the darts. I also neglected to mention Landru's wall as a phaser example. Finally, I'm going to add direct links to the YouTube videos for the poor souls on Apple devices. I'll make the adjustments soon and note them here. All better. Also swapped out the old Insurrection pic montage with a video to save scrolling. Could you please give a source for Hypermatter being a real world term? All I seem to find is Star Wars sites. http://lmgtfy.com/?q=hypermatter+-%22star+wars%22 ... no offense, just showing off the minor search-fu. http://www.madsci.org/posts/archives/2002-01/1010159188.Ph.r.html is a fun result, if uninformative. hypermatter -"star wars" -"death star" as a search parameter works even better, actually. You seem to have forgotten Voyager: Future's End where an entire pickup truck disappears with a single shot. That wasn't the 24th Century model that fired, though I don't think it would play out any differently with a phaser on high setting.